1050 aluminum coil is mainly a cold-treated forging alloy with high strength, far better than mild steel. The 1050 aluminum is formed by adding a small amount of copper to pure aluminum, with excellent forming characteristics, high corrosion resistance, good welding and electrical conductivity. The 1050 aluminum material is common cast-rolling material, namely oxidation, hot rolling material, suitable for customers with high oxidation requirements. 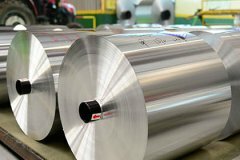 1050 aluminum coil is commonly used in daily necessities, lighting, reflector, decorative, chemical industry containers, heat sink, signs, electronics, lamps, nameplates, electrical appliances, stamping parts and other products. First, the usability is good. Third, high strength heat treatable alloys. Fourth, it is easy to process and has good wear resistance. Fifth, it has good corrosion resistance and oxidation resistance. Eighth, Mature technology, good quality and low price.